In the old days when my children ate cereal I would diligently read the side of the box - who wouldn't be reassured to find such a long list of vitamins and minerals in just one product, that children actually enjoy eating? However there is now debate about whether the body can actually absorb any of these synthetic vitamins. There is concern that the 'extrusion' process used to make cereal not only removes nutrients from the grain but also denatures them making them toxic to the body. Manufacturers also need to add a lot of sugar and salt to create something palatable. Plus from a common sense point of view, anything with a shelf-life as long as cereal is not going to offer the body much nutritionally. However there is a good reason why cereal manufacturers make a fortune selling us overpriced rubbish and that is because in a busy household being able to fling something into a bowl for breakfast is bit of a lifesaver. So I was determined to find a cereal or granola that we could have as back up when porridge, never mind pancakes, just really is too much of a stretch. I also wanted an option that didn’t include oats for people who cannot tolerate them. 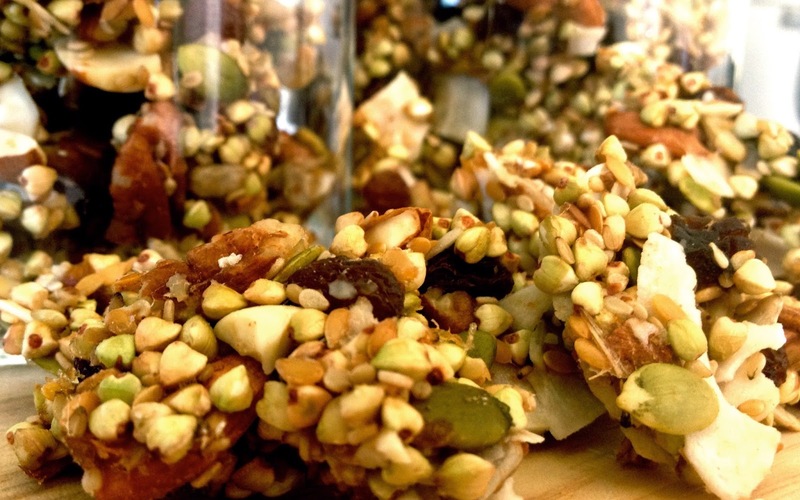 The answer – buckwheat granola! This cereal is nutritionally speaking 'the bomb'. The mix of buckwheat, nuts, seeds, honey and coconut oil offers a wide range of vitamins and minerals (calcium, vitamin E, B vitamins, iron, copper, calcium, magnesium, potassium, zinc and iron to name a few!) as well as being high in healthy fats and fibre. The linseed (or flaxseed as it can be known) is also known to be soothing for the digestional tract. Because the buckwheat groats are crunchy and subtle tasting they are a great base for any combination of ingredients so feel free to change the nuts and seeds to suit preference. As a 'pseudo-grain' buckwheat is also suitable for those on grain free or gluten free diets (however it is not used in GAPS or SCD diets). This cereal works well with yoghurt or even just fruit so it is a good option for people with a dairy intolerance. If you prefer to have a 'loose' cereal (granola generally is chunks of ingredients 'glued' together with sticky stuff like dates, linseed and honey) you can adapt as below. The cereal can be made either in a dehydrator, which will mean it is a ‘raw granola’, or baked in an oven. If you are diligent about soaking and dehydrating your grains, nuts and seeds then this can be done in advance - please see my guide to timings at the bottom. This cereal will keep for a few weeks in a sealed container - I usually store mine in the fridge. There is a lot of weighing out to be done but you will end up with at least three big jars of granola - and it is worth it I promise! In an ideal world the linseeds and dates would be soaked in advance but they can be done at the same time as everything else if need be! 2. Soak the dates in 150ml of warm water to soften. 4. Measure out all the dry ingredients into a bowl and stir thoroughly. 5. Pour the dates (including their soaking water) along with the coconut oil and honey into a processor and blend to a paste. You may need two large trays. Pre-heat the oven to 180C / 160C fan/Gas Mark 4. Line the trays with greaseproof paper and press the mixture down to produce a firm layer of granola around 1 cm thick. Bake for 15-20 minutes then remove from the oven and either flip or stir around so that the top doesn't get burnt. Bake for another 15-20 minutes until crunchy, then remove from the oven and allow to cool. Line the dehydrator with baking paper and press mixture down to produce a firm layer of granola around 1 cm thick. Dehydrate at 8 hours at 40F / 105C. The mixture will then be solid enough for you to (carefully) remove paper) and place back in dehydrator for another 4-6 hours until the mixture is totally dry. If you prepare to dehydrate over night, remove the paper in the morning and give the granola a couple of hours to dry out totally before removing. If you wish to soak the ingredients ahead of time. 3. 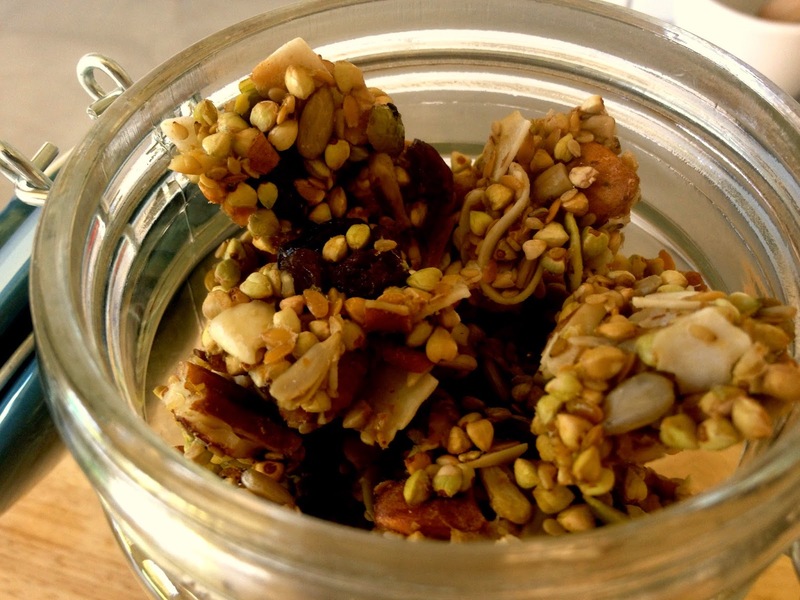 Either dry the nuts and seeds as per your normal method and store in jars until you are ready to make the cereal or follow the recipe above but increase the time in the dehydrator, by another 12 hours to ensure the nuts and seeds are properly dried.